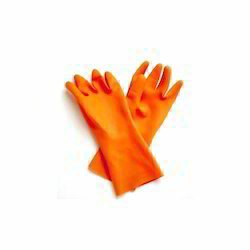 Unisex Latex SafeTouch Orange Industrial Rubber Gloves 12"
Unisex लेटेक्स सेफटच नारंगी इंडस्ट्रियल रबड़ दस्ताने 12"
In order to retain our goodwill in this industry, we are providing a qualitative array of Rubber Hand Gloves. With sincerity and hard work of our vendors' professionals, we have carved a niche for ourselves in this industry by providing quality assured Safety Rubber Gloves. Jersey-knitted cotton gloves dipped with nitrile-butadiene rubber provide enhanced abrasion and puncture resistance, with some chemical resistance. Safety cuff design provides higher wrist protection and easy wear/removal. Available in palm dipped and fully dipped versions. We feel immensely pleased to trade and supply an exclusive gamut of Rubber Gloves. 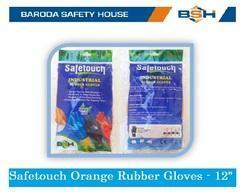 - Used for the protection of the hands while performing tasks involving chemicals.